Snowmobiling is one of the most popular winter activities in the world, giving outdoor enthusiasts a good excuse to head out into the cold conditions to have some fun on the trail. But not all winter destinations are created equal in terms of offering excellent opportunities to experience the sport in all of its glory. To help you sort through the best destinations we've compiled a list of our favorite places to go snowmobiling in North America. Some have hundreds of miles of trails threading through thick forests, while others feature wide open spaces where speed is the name of the game. All of the destinations on this list offer something unique and exhilarating, making them truly adventurous stops for winter fun. If you're visiting Colorado to go skiing in Vail, Beaver Creek, or one of the Summit County resorts, take a day off and go snowmobiling through the spectacular Rocky Mountains while you're in the neighborhood. Nova Guides is located at Camp Hale, where the 10th Mountain Division trained to fight in the European Alps during World War II, and offers some fantastic day trips into the surrounding mountains. The most popular tour here is The Top of the Rockies, during which snowmobilers ride through wooded terrain and up onto open slopes above the tree line, where they soon witness the snowcapped peaks of the surrounding mountains falling away below you. It is also possible to rent snowmobiles here and use the trails independently if you'd like. The company picks up visitors at their hotel and takes them to the timbered Camp Hale Lodge, in a meadow at 9,200-feet above sea level to begin the ride. 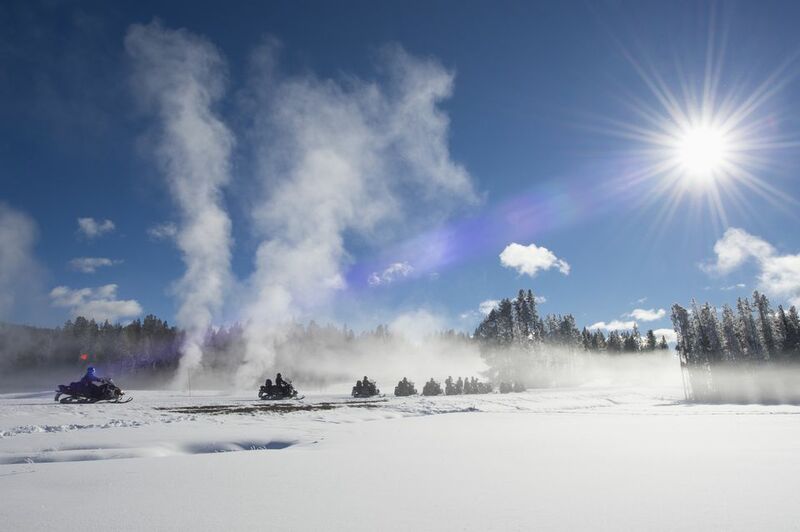 On a one-day snowmobiling trip into Yellowstone National Park, visitors are put on special snowmobile machines that have been configured to be quieter and have less of an impact on the environment. This helps to preserve the ecosystem within the park and doesn't disturb the wildlife quite so much either. You can only drive the snowmobiles on roads, but there are plenty of paces to stop and watch elk nibble the bark off trees or herds of bison wandering close to Yellowstone's famous hot springs located throughout the area. Sharp-eyed visitors may even spot the park's famous wolf packs wandering through the stunningly beautiful winter landscapes. Two Top Snowmobiles offers tours and rentals near the West Yellowstone entrance. Jackson Hole Snowmobile Tours offers trips through the park's South Entrance as well. The ride to Old Faithful, from either location, is one of the most popular tours in the park no matter which direction you're coming from. The towns and villages in the Adirondacks have an extended, interconnected trail system that weaves its way across much of the region. It's easy to rent snowmobiles in a number of the local towns, or bring your own and start exploring completely independently. The St. Lawrence region alone has more than 750 miles of winding trails to keep riders busy and when you're done riding for the day, there are lots of hotels and restaurants to relax in too. If you're looking for a guided tour of the region, C+C Adirondack Snowmobile Tours can accommodate. The company can accommodate both beginner and advanced riders alike, with one- and two-hour excursions available. Snowmobiling is one of the best ways to explore Alaska during the winter, where you'll discover some of the wildest terrain on the entire continent. The Alaskan backcountry is some of the most rugged and remote found anywhere on the planet and much of it is inaccessible throughout the long winter unless you're riding a snowmobile. It is not uncommon to spot bald eagles overhead or moose foraging in the snow while exploring the remote trails. Even when riding close to Anchorage you could find yourself on routes that follow along sheer ridges that appear as if they could slide right into Resurrection Bay. Alaska Snow Safaris is one of the best options in the state, offering both single-day and multi-day trips. But, in a place where the winters are long and the snow flies throughout much of the year, there are literally dozens of excellent snowmobile rental stations and tour organizes. You'll find a few listed here. You'll never explore all of the 6,500 miles of groomed snowmobiling trails found within the state of Michigan, but you'll certainly have an amazing time trying. Those trails weave in and out of state forests, three national forests, and miles of other public lands designated for outdoor use. The more remote and wild trails are found on the Upper Peninsula, which has an impressive 3,000 miles of groomed trails itself. To truly get away from it all, cross the bridge and head up state for some amazing riding. With so many trail systems to explore, you could go all day without encountering another living soul. You'll find plenty more details, including routes and trail conditions, on Michigan's snowmobiling page. On that website you'll find information on current trail conditions as well as intel on the best locations across the entire state. It is a great resource for anyone heading to the wolverine state for a little riding. Snowmobiling in this predominantly French speaking Canadian province, especially on the routes in the Gaspe Peninsula and the Northern Trail, delivers a novel ambiance that is very different than what is typically found while exploring trails in the U.S. The lodging, cuisine, and art in the villages are special, as are the people. Depending on the route you choose, you might even have to load your snowmobiles onto a ferry to cross the ice-floe dotted St. Lawrence River. With its distinct architecture, French language, and unique culture, you'll be excused for thinking you may have ridden you snowmobile all the way to Europe. Proud Quebecers claim that the sport of snowmobiling actually began there and they remain passionate about riding to this day. There is no denying that Quebec is a winder wonderland, and there are plenty of trails to ride and places to rent a machine for those who don't bring their own. If you're in southern, Utah, take a snowmobile excursion into the Dixie National Forest to find spectacular views of the dramatic red-hued stone cliffs of Cedar Breaks Monument, which stand in stark contrast with the pure white snow. The Brian Head route is an especially popular one, which means that it can get crowded at times. But, it is well worth the ride when you consider the stunning views found along the way. Snowmobile rentals are easy to come by throughout the state and fresh powder is usually easy to find. Experienced riders will want to leave the more well-traveled trails behind and experience backcountry exploration instead. Here, skill and finesse are required, but the rewards in terns of views and the overall experience simply can't be beat. Not all of the great snowmobiling is found in the western U.S. Winter warriors in the east will find exceptional riding throughout New Hampshire too, where the Bear Notch trail system offers 50 miles of closed routes dedicated to the sport, while the Pittsburg region alone has 200 miles of trial to explore. All told, there are more than 7000 miles of trails spread out across the state, making it a mecca for snowmobilers from across the country. As such, there is a great support infrastructure in place, with rental shops, hotels, restaurants, and other attractions in abundance.